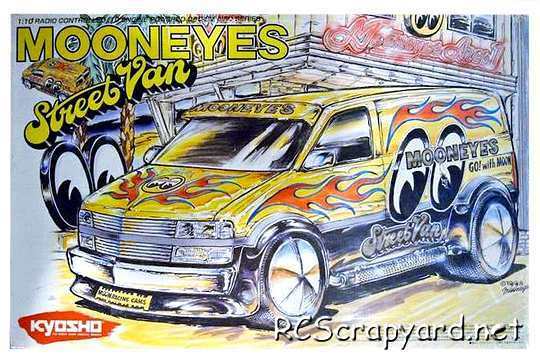 Kyosho MoonEyes Street Van - # 31852 • (Radio Controlled Model Archive) • RCScrapyard. 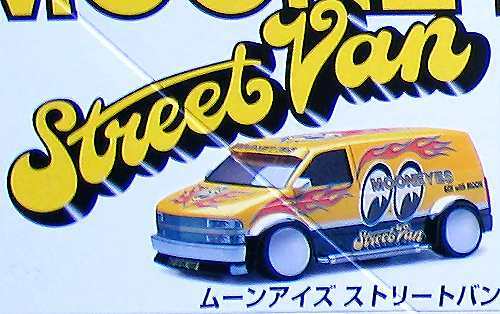 Released by Kyosho in 1998, the 4WD MoonEyes Street Van - # 31852 - came with a QRC "Quick Reverse Clutch" and a GS-11X engine. The model is shaft driven, on a 2mm alloy chassis, with gear differentials, coil spring over oil filled dampers, dogbone drive-shafts and metal bushings, ring type bearings. To race the Kyosho MoonEyes, it requires time and patience, to tune and adjust for improvements in handling and steering ability and to get the grip you need to stay on course when manoeuvring around tight, slippery corners. A little can be a lot when it comes to changing your cars settings and our easy methodical directions will guide you to the best Set-up to help you win and keep you winning. 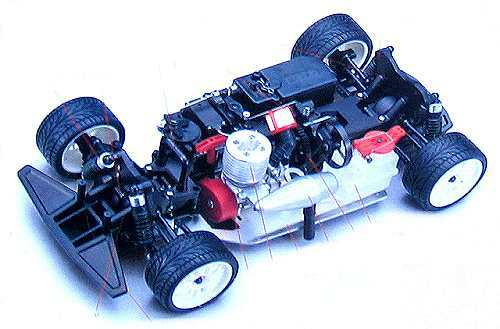 Buying a used Kyosho MoonEyes Nitro Truck, or any used RC Model, has a number of advantages. It is generally cheaper than new, ready built and may come with a variety of expensive hop-ups already installed. Cheap, pre-loved bargains are always becoming available. However, depending on the age of your purchase, it may need a little tender loving care before you can take it out on the back yard. If the body shell of your Kyosho MoonEyes is broken, ripped or damaged in any way, this can be easily repaired with rubber solution glue. Also, for added protection and if available for your MoonEyes model, fit an under guard to stop dirt and gravel entering the chassis. If you intend to race your MoonEyes Truck model at a competitive level, I would also recommend you obtain and fit titanium pivot shafts, turnbuckles, tie rods and steering rods. The MoonEyes steering servo is also prone to damage. In high speed crash situations, the fragile gear teeth of the servo can be broken off, rendering your expensive servo useless, so be sure to obtain a good quality "Servo Saver". Check out my Servo Information article. If body roll on your Kyosho MoonEyes is a problem, handling can be improved with the use of stabilizers, anti roll or sway bars, stiffer tuning springs and, or, thicker silicone oil in the dampers. Finally, good luck with your MoonEyes model and good racing. When you first started in RC, you may have purchased a package that came with the car kit, motor, battery, charger, ESC and radio system complete. The transmitter was probably just a basic steer wheel, or stick type, with nothing more than forward, reverse, left, right and simple trim settings to centralise the servo and ESC. After a while, as your enthusiasm grows and your experience increases, you will want to move on to a better radio system, with more setting options, but where do you begin? Choosing the right transmitter is a personal thing. It has to feel right, have the balance you like, not be too bulky for your hand size and have all the features you might need to set up your car to your driving style. Transmitters these days are highly sophisticated pieces of engineering and once you choose your transmitter you will probably stick with it for the rest of your competitive career. Don't just go for the one you see in a review that looks and sounds like the best thing there could ever be and came at a bargain price. Then when it arrives through the post and you get it in your hands it just doesn't have the feel you thought it would have. Sits awkwardly in your hands and is so complicated to set up you need a university degree to understand it. Talk to the experienced racers at your local track, ask them their opinion, see what their transmitter is like and if they will allow you to, hold it in your hands and see how it feels. All the best buys in life are made by recommendation. Then, once you have some idea what you are looking for, look on the internet for that model to get the best price, or go to a dealer and check out the latest models. Frequency choice depends on where in the world you live and what form of RC you are into. Fortunately, most of the top end transmitters can change to different frequency ranges by simply fitting a different module, so if you ever move up to an international level, you don't have to buy a new transmitter, just a module and receiver. In plain language, Bumpsteer is exactly what it sounds like. If your car goes over a bump, it will affect the toe-in setting and can on some tracks make handling of the car in a straight line difficult. To check if your car might have any problems with bumpsteer, have it in race mode, with the motor and battery etc in position. Place the car on a flat surface and push down your car at the front. Looking down from above, keep a close eye on the wheels and watch for any angular movement to the side. If there is then you have bumpsteer. For off road cars, because of them having longer dampers in comparison to on road, a small amount of toe out is considered by many as acceptable in the lower position and can sometimes be used as a tuning option because of its aggressive effect on turning ability when entering corners. On road cars, because of the shorter damper movement and the greater need for precise steering and stability in a straight line, generally have less of a problem. However if bumpsteer is detected, drivers generally try to eliminate this as much as possible. The standard settings for most kits from all manufacturers are adjusted to reduce bumpsteer as much as they can and it is only when you come to make changes to those settings yourself, to suit your personal driving style that bumpsteer can become a problem. Any changes you might make to the steering links or the caster could induce some bumpsteer, so you should check for it each time you make any adjustments in these areas. To adjust bumpsteer try adding or removing washers under each steering link outer ball stud. More washers will increase and fewer washers reduce bumpsteer. Steering geometry can be tricky to setup for those new to the sport and even some more experienced racers can struggle with this problem. So, unless you are having major problems with your cars handling, try to avoid making any radical changes and if you do, remember to only make one change at a time and make a note of it for future reference, incase you need to remove it.